Cast aside outdated conventions of what counter stools of old have been, and experience a level of unsurpassed comfort while relaxing in the next generation of home furnishings. Soft, round lines accentuate the masterfully contoured seat and chair back, which is embroidered with square stitching that'll look right at home whether it's used at a counter or elsewhere in the home. Since we're certain that you're going to fall in love from the first time you take a seat, every facet was designed to stand the test of time. From the solid one-piece construction, to durable stainless steel legs, and resilient textured polyester upholstery, this chair will look just as great years down the road as it did the first time you laid eyes on it. Comfort meets classic styling in the elegant Havanna swivel barstool. The seat of this sturdy 24-inch barstool is covered with a durable faux leather fabric and rests on a dark rubber wood frame that will effortlessly complement a wide variety of interiors. This comfortable upholstered barstool is a stylish accent for a bar or a kitchen island, and the webbing seat structure of this chair ensures it will stand up to regular use with ease. Complete the look of your dining or home-entertaining space with several of these versatile chairs. The perfect combination of style and durable design, this beautiful backless bar stool from JR Home Collection makes a terrific addition to any kitchen counter or breakfast island. You'll appreciate how well its traditional design fits into any room in your home. The brown base frame colour gives this piece a stylish vibe, perfect for bringing a touch of flair to any room. 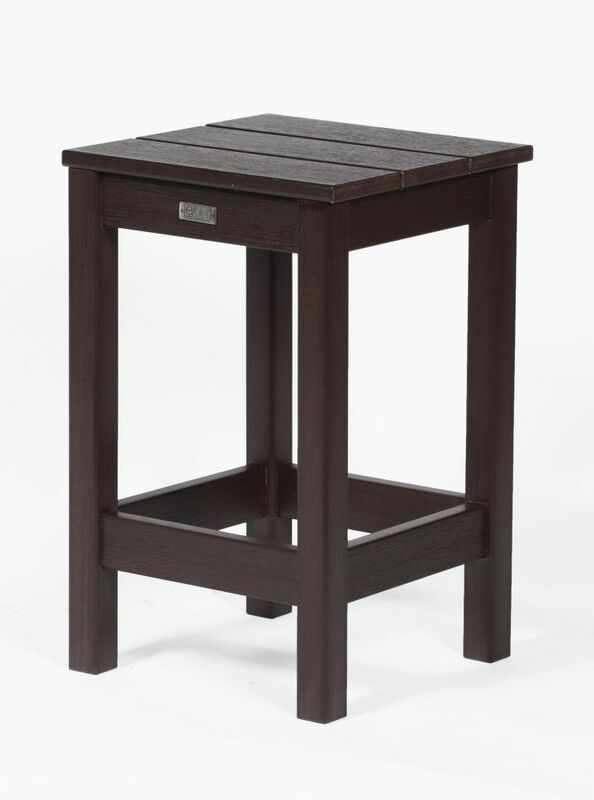 Milan Patio Stool in Espresso The Eon Milan Counter Height Dining set truly delivers lasting natural beauty. Crafted from an innovative all-season resin that boasts incredible fading and weathering performance, Eon's premium products maintain their beautiful, natural wood-like appearance over their very long lives. Eon technology eliminates the frustrations associated with sanding, staining and painting. Eon is one of the finest alternatives to wood available on the market today. This beautiful Milan ensemble is comfortable and durable, and designed for easy assembly. The dining table measure 40" square and includes an umbrella hole. The stools are available in both Teak and Espresso finishes and are exceptionally strong. Counter Height dining seat height is in between a regular dining chair and bar height dining, therefore allowing for very easy access and exit. The Milan Counter height dining set is great for balconies, decks and terraces when the view is the main attraction!